Provide comfort for the family of Charles Ramsay with a meaningful gesture of sympathy. Charles B. Ramsay Jr. of Boston went to be with the lord on January 31, 2019. 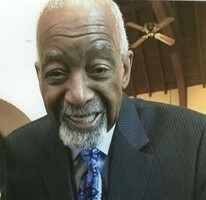 He was born on March 29, 1929 to the late Mr. and Mrs. Charles and Gladys Ramsay. He is preceded in death by 3 sisters. Charles is survived by his loving wife Leslie Ramsay, his daughters , Saran Ramsay and Akia Obas, one granddaughter Layla Obas , other relatives and friends. There will be a Viewing on Monday, February 4, 2019 from 10:00 to 11:00am followed by Funeral Service at 11:00 O’clock, St. Cyprian’s Episcopal Church, 1073 Tremont Street, Roxbury , MA 02120. To send flowers in memory of Charles B. Ramsay Jr., please visit our Heartfelt Sympathies Store. Provide comfort for the family of Charles B. Ramsay Jr. by sending flowers. I am very sorry to hear of your loss. Death is never easy for any of us. I am encouraged by the comfort that the scriptures give at Revelation 21:3,4 where it mentions that “death will be no more”.would you not agree that the one who gives life would have the ability to restore life if lost? Yes for at John 5:28,29 we read that “there is going to be a resurrection”. What a marvelous hope that is for all of us. I am hoping that these scriptures will give you encouragement and peace at this most difficult time. Sincerely GDenise L.
Today, I learned that your family is mourning the loss of your beloved Charles. Please accept my condolences and be assured that almighty God is certainly aware of your painful feelings. May God comfort and sustain you to get through this day and others to come (Isa 41:13). Wishing your family all the best at this most difficult period. To the family of Charles Ramsey, So sorry for your loss John and I know the heartache you've endure by such a loss. Charlie as we all called him was a pleasure and a joy to work with, I can still picture his smile and hear his laughter. Charlie never say a bad word to any one he will be surely missed. Love him but let him go because Jesus loved him more REST IN PEACE Charlie. John and Pauline Davis Port Saint Lucie Florida.